Align toes, improve balance and stability. Similar to braces impacting the alignment of teeth, Correct Toes slowly and progressively change foot architecture. Structural changes create a wider base of support, improving balance, proprioception, gait and posture. Strengthen muscles throughout the foot. ​Accompanied by naturally-shaped footwear, Correct Toes encourage the foot to move, flex and bend. As muscles strengthen in the foot and lower leg, the foot is able to support itself. This eliminates the need for artificial arch support and orthotics. Restore foot function & relieve foot pain. Correct Toes is a foot health tool that can be used to restore normal and natural foot and toe function. Foot pain and problems can be resolved when the toes are realigned in the way nature intended. 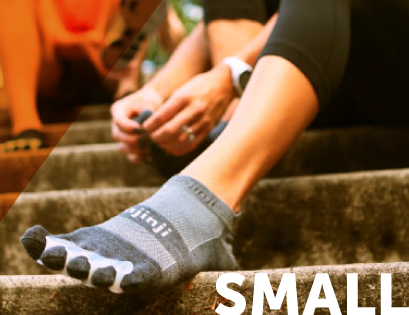 Can be worn barefoot or inside your shoes while active.The underlying issue of most foot problems stem from the simple fact that traditional fashion footwear alters the natural human foot shape. 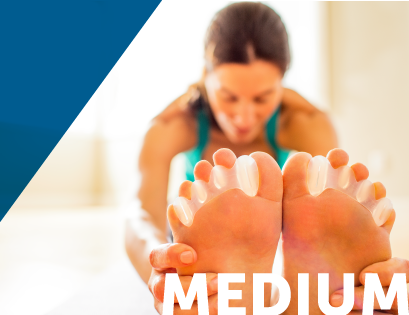 Correct Toes, designed by sports podiatrist Dr Ray McClanahan, help the foot rehabilitate from the negative effects of conventionally shaped footwear. ​The device, made of soft, flexible silicone, encourages the toes back into their natural alignment found at birth. With progressive and consistent use while active and weight bearing, toes align and feet strengthen, restoring your foot’s original position and function. When used properly, Correct Toes are comfortable and economical - they are much cheaper than buying expensive orthotics, shoe inserts, corn pads and supportive shoes. More importantly Correct Toes can help you avoid surgery in the long run. If used correctly this product will truly make a difference to restoring healthy feet! AVAILABLE IN THREE COLOURS - Clear, Plum and Aqua.... never get your Toes mixed up with your partner's Toes again! To learn more about Correct Toes I suggest your visit our Video Library - Dr Ray McClanahan is extremely knowledgable and covers a whole range of topics and questions. Check out the testimonials below, look at the Correct Toes FAQ section, send an email or contact Nobert on 0434 397 674 for any questions. Can be used on bare feet, over toes socks or in healthy footwear such as Lems, Vivobarefoot and our Sandals. What our feet should really look like. 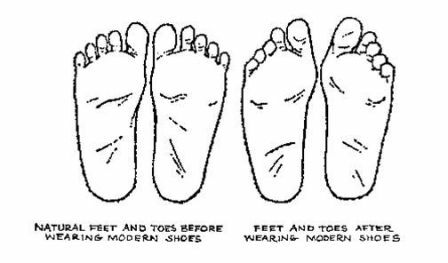 ​If you are familiar with Correct Toes please note that the old small is now extra small and the new small is a size in between the old small and medium sized Correct Toes. Still unsure of which size is best for your feet? Click here to email a picture of your feet (preferably beside a ruler) to Norbert, or call him on 0434 397 674 and he will be happy to assist you. Note: you can modify your Correct Toes to get a better fit. They most commonly need to be modified if it's spreading your 5th toe (pinky toe) too far. See the video 'When to Modify Correct Toes' or download the modification guide here. * Please note these are approximations. Your size is based on foot and toe width. If you are between sizes, consider sizing up if you have a wide foot. I started using Correct Toes over five years ago and was amazed at the change in my toe alignment and overall foot health after a relatively short period of time. These really are a miracle product for anyone with foot, toe, ankle, knee, hip and even back problems. Have a look at my feet in this picture and see the change after one year regular usage. I was so impressed that I arranged a consultation with Dr Ray McClanahan, the inventor of Correct Toes, and became one of the first official Australian distributor. I'm often seen wearing my Correct Toes around the streets of Noosa. 1. Correction of many common foot and leg problems, including bunions, hallux limitus and rigidus, tailor’s bunions, corns, ingrown toenails, heel pain, plantar fasciosis, neuromas, capsulitis, lower leg pain, and runner’s knee. No surgery or medications required! 2. Better balance in athletes, Parkinson’s patients, and elderly. 3. Decreased injury rates in athletes, due to allowing the body to make better use of natural physiological adaptations that are hampered by current footwear available to athletes. 4. Increased performance in athletes (especially walkers and runners) by promoting foot positions that scientific studies have shown to have a 4 to 5% performance edge. 5. Improved strength and flexibility of the toes. This enhances proprioception, and subsequently the brain signals the body to move forward more naturally. 6. Less osteoarthritis (also known as degenerative arthritis), which currently plagues a majority of senior citizens, as well as a high percentage of the younger population. Correct Toes are reversible! Each individual silicone Correct Toe spacer is identically casted so are interchangeable on the right or left foot. What conditions can Correct Toes help? Amazingly, no orthotics, surgeries, or medications are required! Correct Toes spread the toes in a way that re-approximates their natural anatomy. Why is this important? We spend a lifetime in footwear that is too narrow at the ends of the toes, resulting in our foot shape changing such that the toes become scrunched together. Having spread toes is essential to proper gait. Correct Toes work in a similar way to how braces work for teeth by placing the toes into optimal alignment and, slowly and progressively, changing the architecture of the foot. The muscles and other tissues of the foot and body are able to adapt and strengthen accordingly. The ultimate goal is to return the foot to its natural shape! Correct Toes are placed in between the toes. They are designed to be worn either barefoot, in wide slippers or wide shoes. Important note: the shoes MUST be wide enough to accommodate the toes with Correct Toes in place. The best results are seen when people incorporate them into their daily weight-bearing activities. Check out our range of Lems Shoes. It is important to incorporate Correct Toes SLOWLY and progressively. We recommend wearing them for a half-hour the first day and then increasing the time by approximately 30 minutes each day. This will allow your body to adjust to the changes. You may experience some soreness at first, as would be expected when muscles are being utilized in a novel way. Just like with any new activity, the soreness should subside and your muscles will end up stronger and more capable than before. We wish it were that simple! It’s not quite that easy, but it’s not complicated either. The whole idea behind Correct Toes is that they position the toes in the correct way. It is also vital to utilise shoes that are completely flat, lightweight, flexible, and sufficiently wide in the toe box, so that the foot can function like a barefoot inside the shoe. This type of footwear must be used on a very regular basis. Unfortunately, such footwear can be difficult to find, which is how we came to stock Lems Shoes. Following the above plan, you can expect to see positive results. This is a very important question! Unfortunately, almost all the footwear available on the market does not respect natural anatomy. In a natural foot, the widest part of the foot is at the ends of the toes, not at the ball. The trick to finding appropriate footwear is to make sure that the shoe is the same shape as your foot. The best way to test this is to pull the liner out of the shoe and stand on it. No part of your foot should hang over the liner. If it does, the shoe is too narrow. Always seek shoes that are completely flat, wide in the toe box, and flexible. We think Lems Shoes are the best shoe on the market. 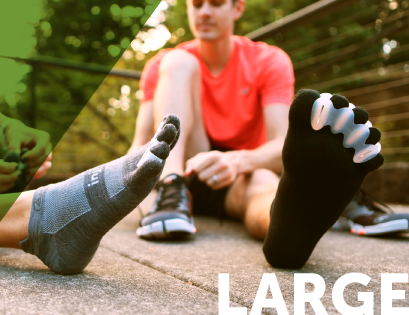 Correct Toes now come in four sizes: EXTRA SMALL, SMALL, MEDIUM, and LARGE. Unlike many other foot products, the Correct Toes size you require does not depend on your shoe size. Instead, the Correct Toes size best suited for your individual toes depends on the width of your feet, the width of your individual toes, and the degree to which your toes are already splayed, or spread. ​Your Correct Toes toe-spacing appliance should not "bunch" between your toes—this would be a sign that your Correct Toes toe spacers are too large. Your toe spacers should not pinch your toes, either. Toe spacers that pinch your toes are too small. Correct Toes can be further customized for a wide variety of feet, contact Norbert if you are unsure. Some people may need to start out in a smaller size and move up to a larger size as foot adaptations take place. In most cases we find that the LARGE size works best for individuals who wear a mens size 11.5/12 shoe and higher. If you think you might be in-between sizes, you can email us a picture of your feet taken while standing next to a ruler (to show the length and width of your foot). This image can give us a more accurate picture of which size is most appropriate for you. How are Correct Toes different than a pedicure set? Correct Toes go beyond simply “spacing the toes.” It is podiatrist-designed product that places each toe in the correct anatomical position in relation to the ground and to one-another. It mimics the natural barefoot position that is commonly seen in people who go barefoot for most of their lives. Correct Toes do not arbitrarily space the toes. Correct toes are designed by a podiatric physician (a.k.a., foot doctor), Ray McClanahan, DPM. Dr. McClanahan is an expert in foot anatomy and human physiology. Furthermore, Correct Toes are clinically tested on hundreds of patients, with outstanding success. Most toe-spacing products are to be worn only while barefoot and while sitting (non-weight-bearing). They are bulky, and it would therefore be impossible to use them while standing, walking, or in shoes. Correct Toes are the ONLY product that is specifically designed to be worn in footwear and during weight-bearing activity. This is essential for attaining the best possible results in making actual changes to the foot and alleviating foot problems. Correct Toes are designed to be worn in shoes during weight-bearing activity, such as running, walking, hiking, and standing. They can also be used barefoot around your home or when you are practicing yoga, tai chi, qigong, or other movement arts. Wearing Correct Toes frequently and while weight-bearing leads to the most effective results. Correct Toes promote balance. This is incredibly useful in yoga practice and therapeutic for people with Parkinson’s Disease. It is also useful for senior citizens in preventing fatal falls—a common injury among the elderly. Correct Toes are constructed of medical-grade silicone, which make them both flexible and highly durable. They are comfortable and built to last. Correct Toes is a top-quality product! When used according to package instructions, Correct Toes offer customers a method of permanently fixing their foot/ankle ailments, without having to resort to custom orthotics ($-hundreds) or surgery ($-thousands). Correct Toes are a tremendously reasonably-priced alternative. “When can I expect to see results?” is a common question patients ask about Correct Toes, and it reflects patients’ desire to resolve existing foot problems, restore normal, healthy foot anatomy, and prevent future foot, ankle, and lower extremity ailments. We find that most people, most of the time, experience some immediate relief, with continued positive musculoskeletal health benefits occurring over many months and years. Of course, results may be different for different people, and the direct and indirect health benefits of Correct Toes depends on many factors, including your age, your tissue mobility, how frequently you use your Correct Toes toe spacers, your physical activity level, and how often you wear appropriate footwear, to name a few factors among many. Most people can expect to feel and/or see the beneficial effects of Correct Toes within the first 30 minutes of use. However, for architectural changes to occur, both time and dedication to Correct Toes use is important. For example, in attempting to reverse a bunion, some movement of the big toe (which is lacking in many patients with this health problem) likely will be visible within a few months of regular Correct Toes use (especially in people who use Correct Toes during weight-bearing activities). Further favorable changes will continue over many months or years. Wearing Correct Toes is, ultimately, an investment in lifelong foot health. Think of it this way: It took a lifetime for your feet to conform to the narrow toe boxes of conventional footwear. Over many years, your foot shape changed, causing the muscles, tendons, ligaments, and soft tissues involved in standing, walking, and running to adapt to help slow this deformation. It is most certainly possible to undo these negative changes—we see it in our patients all the time—but sustained, long-term changes in foot form do not occur overnight. You should anticipate using Correct Toes as a part of your foot care plan for many years. Positive changes in your foot symptoms, form, and function will occur much sooner than this, though only continued use of the Correct Toes toe-spacing appliance will ensure ongoing and lasting natural foot health in adults who have used conventional footwear since youth. To help illustrate the restorative effects of Correct Toes (and to give you a general sense of the timeline for significant toe realignment), let’s look at three unique groups: Children, athletes, and elderly individuals. Children are the most adaptable of the three groups (i.e., a little bit of effort in restoring proper foot anatomy goes a long way with this group). In many cases, children’s feet respond quickly to corrective toe positioning, and the long-term use of toe spacers may not be necessary. Athletes are an interesting group because they can do considerable damage to their feet through the prolonged use of severely constricting footwear, yet they respond very well to Correct Toes when the toe spacers are adopted and used in appropriate footwear. Athletes, especially runners, subject their feet and toes to tremendous repetitive forces during weight-bearing activity. If the toes are properly aligned, however, these forces can accelerate the corrective effect of the toe spacers. 2. It is possible to decrease the space between your fourth and fifth toes. This may be useful if: the 5th toe (“pinky” toe) is pushed out too far (this occasionally happens for some types of feet) or to use Correct Toes in shoes that are almost, but not quite, wide enough. To accomplish this, start by cutting ½ of the small interspace along the vertical plane. This will diminish the space between the last 2 toes. If necessary, the whole 4th interspace can be removed. Correct Toes will still work quite well. Correct Toes eliminate the need for conventional orthotics in most people by enabling your foot arch (i.e., your medial longitudinal arch) to support itself. In general, we DO NOT recommend wearing Correct Toes in combination with orthotics, we instead recommend weaning yourself off orthotics—slowly and progressively—when introducing Correct Toes. Correct Toes are, by definition, an orthotic, though conventional custom orthotics are placed under your foot arch (instead of between your toes) and attempt to alter foot position by using an unnatural methodology (i.e., by propping up your foot arch). Anyone with diabetes or with diminished sensation of the feet should NOT use Correct Toes. Also, anyone with a diminished circulation condition, such as peripheral arterial disease or “PAD”, should NOT use Correct Toes. If for any reason you are uncertain about whether you should use Correct Toes, you should consult your holistically-minded healthcare provider. Shims are used for individuals rehabbing a bunion or Tailor’s bunion that need additional space between their 1st and 2nd toes or 4th and 5th toes. The cavity in the large and small pylons of Correct Toes can be modified to add material and create additional spacing. Typically the material that we add is from footwear—an old sock liner or any other thick, soft foam will work best. To insert the shim into Correct Toes, first cut a small square or rectangle of foam. Thread a pair of tweezers through the cavity opening. Place the cut piece of foam in the tweezers and slide the tweezers back through the cavity so that the foam is inserted into the cavity (see video for placement). This modification is suggested after 3-4 months of Correct Toes use. Shim material is not provided with the purchase of Correct Toes. No Problem. Click here to download the User Manual.